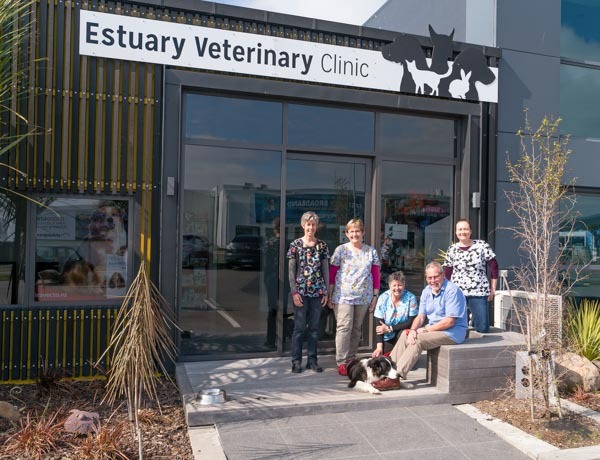 Great things come out of a trusting two-way client relationship – Daryl and Tara of DJ Hewitt Builders, and Griff and Maree Lash of Estuary Veterinary Clinic, are testament. Originally neighbours two decades ago, ‘take one’ was in 2002 when Daryl built a mezzanine floor for the Ferrymead-based clinic’s 21-cage cattery. ‘Take two’ in 2007, he enlarged the next clinic by 137sqm – until liquefaction destroyed the good work in 2011. ‘Take three’ was a fit-out of an interim unit, right next to the current clinic. This shaggy dog tale had a happy ending this year, and ‘take four’ was the 180sqm fit-out of unit 4 1091 Ferry Road. Daryl utilised the empty adjoining warehouse to accommodate two consulting rooms, one a spacious 48sqm with water views, and separate cat and dog hospital wards. “He custom-built for our needs to fit our large bench unit and up-to-date equipment such as dental x-ray, digital imaging, diagnostic equipment, new dental station and space for a mobile animal cage,” Maree says. Perfect for high-paw traffic, the polished concrete flooring works well. “We needed a natural-looking, wash-and-wear floor. Everyone loves it.” Daryl worked on the Lashs’ home rebuild recently, and also the Christchurch After Hours Veterinary Centre. “Daryl’s wife, Tara, was our interior consultant. She knows exactly what I like! “We know all his staff and subcontractors now; they’re a pleasure to work with. The finish is always to a high standard, and Daryl and his team always listen to our needs, creating solutions and giving recommendations.” And the Hewitts appreciate their beloved Schnauzer, Porscha, is in Griff’s caring professional hands.